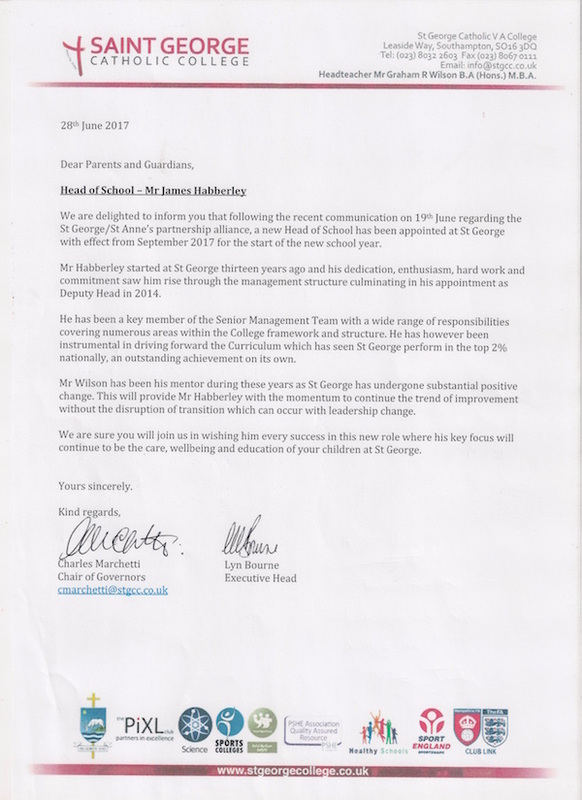 Further to my previous communication in March this year when I informed you that Graham Wilson, our Headteacher, was leaving St George, I am delighted to update you on the progress to replace him whilst maintaining continuity and minimizing any upheaval during transition. It is with great pleasure that I am able to tell you about an exciting opportunity for the future of St George and for Catholic secondary education in Southampton. The Governors of St George and the Diocese of Portsmouth have approached the Governors and Trustees of St Anne’s Catholic School and Sixth Form College to develop a new role of Executive Headteacher in providing strategic leadership to each school through a joint partnership alliance. We have agreed the terms of our co-operation in principal to enable us both to communicate this exciting news whilst the final details between our Governing Bodies are being drafted. The proposal would mean that Lyn Bourne, currently Headteacher of St Anne’s would take on this role and she would therefore be sharing her time 50/50 between both school sites. A new Head of School would be appointed internally at each school to have the day-to-day responsibility for the running of St George and St Anne’s respectively. It is important to note that the two schools would remain separate institutions, continuing to develop their own distinctive character with St Anne’s remaining under the Trusteeship of the LSU Community and St George, the Diocese of Portsmouth. The final details are currently being discussed by both Governing Bodies and this will be concluded on a timely basis. Please be assured that the best interests of our students continue to be the first consideration at all times and any decisions will be made accordingly. If you have any questions/comments, please do not hesitate to contact me.